Curious about Twilio Flex but not sure how to get started? Want to know what a contact center application platform is? 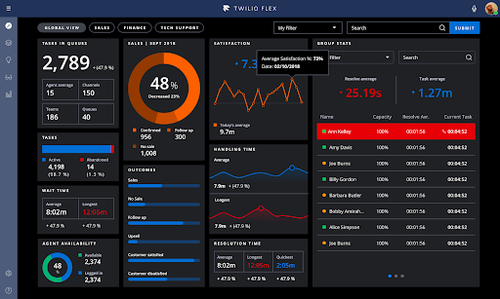 Here’s a quick primer on Twilio Flex and how to launch your contact center in minutes. Flex is an instantly deployable, fully programmable contact center platform that enables you to launch a contact center out of the box. But unlike other cloud-based solutions, you can completely customize any layer of the stack using simple web-based frameworks such as RESTful APIs and React.js. We designed Flex to run on top of Twilio's reliable and secure Super Network infrastructure, so it easily scales to thousands of agents in the cloud. Want to try Flex for yourself for free? Go to Twilio.com/flex and click on Get Started Now. When you sign up for Flex in the console, you get 5,000 free active user hours that you can use to experiment or build a proof of concept. Active user hours represent the number of hours that your agents, supervisors, and administrators are actively using Flex. 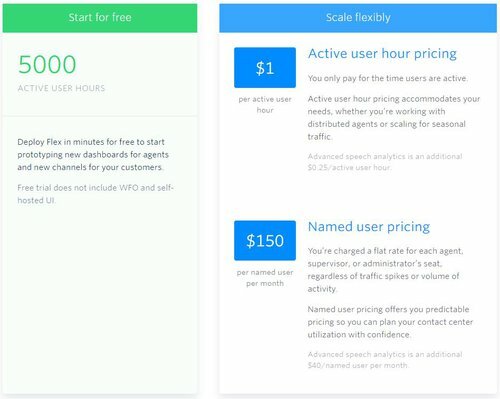 After the first 5,000 free hours, you can choose to pay $1 per active user hour or $150 per named user per month. Both of these plans include workforce optimization and every customer-facing channel you need, ready to go out of the box. And as new channels are added to the Flex Marketplace—a continually-growing application platform for pre-built integrations from expert third parties—you can add them in an instant. Carrier connectivity, such as phone numbers, PSTN minutes, and SMS are charged at Twilio’s regular usage-based prices. Ready to see Flex in action? We created this video to show how you can deploy a contact center using Flex in minutes. Feel free to follow along in the Twilio console while you watch. I’ll walk you through creating a Flex project, naming it, and inviting others to participate in a few clicks. Twilio will instantly launch an instance of Flex for you that will run at flex.twilio.com. We’ll then choose your template and get you oriented with the agent, admin, and supervisor desktops. Your first task will be an onboarding task which sets up your trial account. From there, you can play around and see what it’s like to call, text, or connect to the contact center via web chat and see how those tasks show up for agents. I’ll show you the supervisor and admin dashboards so you can see how their view looks. You can also configure these templates at any time. 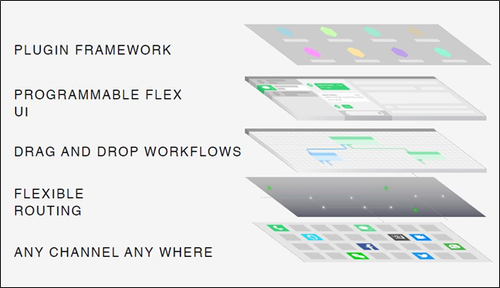 We’ll look at workflows and routing, which you can change through the drag-and-drop visual builder, Studio. I’ll show you how simple it is to edit a flow, such as adding an automated message for your customers. Using the plug-in model, which makes things easy because you only have to drop in the code for what you are going to change, I’ll show you how to configure a CRM, add a message translator plug-in, and add sentiment analysis. I’ll also show you an example of complete customization of a supervisor desktop. Lastly, we’ll take a look at Flex Workforce Optimization. (Keep in mind that your free Flex account does not include workforce optimization, but this is available once you upgrade to a paid account.) We’ll navigate through different dashboards, analyze reports, and create assessments. We’ll also look at different KPIs for different time periods as well as speech analysis and keyword spotting. Ready to go? Get started at twilio.com/flex.